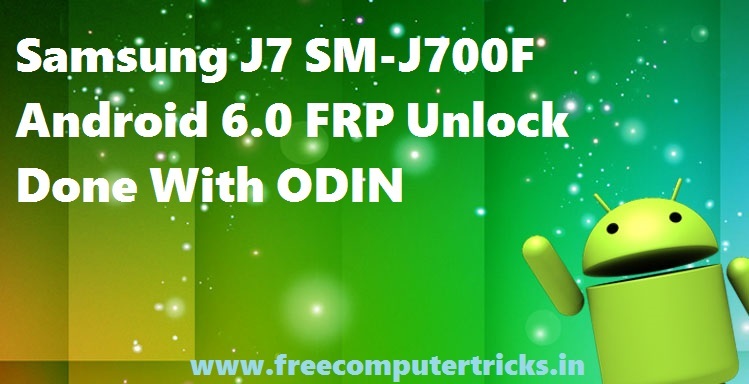 How to Unlock FRP Lock Of Samsung J7 SM-J700F Android 6.0 Using ODIN? Samsung J7 FRP Unlock File Download and ODIN3 Samsung Flasher or Downloader Tool Download Here. Samsung J7 has got the Android 6.0.1 update and the Android security patch level updated as of 1st August 2017 with security software version ASKS v1.2 Release 161011 SMR Aug-2017 Release MS. The device also gets the Knox version KNOX 2.6, Standard SDK 5.6.0, Premium SDK 2.6.0, Customization SDK 2.6.0, Container 2.6.0, CEP 2.0.1, Enterprise Billing 1.2.0, OTP 2.6.0, SE for Android 2.4.0, SSO 2.5.0, Shared Devices 2.6.0, TIMA 3.2.007 and VPN 2.2.5. These are the technical information of Android update that the Samsung J7 J700F has now a days as of 13 May 2018. Here in this article you will come to know, how to do frp bypass on your Samsung J7 having Android 6.0 Operating System. If you forgot the Email id and password of the phone previously used in that phone then if you Factory Reset the phone it will ask the Email id and password to move forward or to get into the phone. If you remember the Gmail id and Password it helps you to restore your contacts and all other data it backed up. If you do not know the email and password then this tutorial will help your to bypass or unlock or reset frp lock of Samsung J7, please go through the below steps. You can bypass frp lock of Samsung J7 using Odin3 Downloader or so called Odin flash tool or some other call the tool as ODIN. To bypass frp please download the below "FRP Unlock J7 File" and download Odin3, then flash the phone. Download Odin3 from the below link. Download J7 FRP unlock file. Now open Odin3 and click on AP Tab and select Exynos.tar file. Connect the phone to the Computer using USB cable. Now click on Start button on Odin Flash Tool and wait until you see PASS. That's all now your phone will reboot and go to the settings, then enable Developer Mode and then OEM unlock, then finally do a Factory Reset. There are two files in the zip file use Exynos CPU file on Samsung J7 to bypass frp lock. Question: After flash with FRP unlock file my phone is showing Unfortunately Stop for all apps. Ans: After switch on please go to the settings and do a Factory Reset, do not forgot to enable Developer Mode and OEM Unlock. Question: After flashing with J7 frp file using Odin, unable to bypass frp. Ans: Please follow the above process carefully, if still you are facing problem to bypass frp then do hard reset with enabling OEM unlock or after flashing with this frp unlock file you can use Miracle Box 2.54 use the Samsung Tab and do Reset FRP. Question: Where to download Miracle Box Software v2.54, working without box? Ans: Search this site using the Google Search Box (On the Left Side Bar) for "Miracle Box V2.54" and Download it. Question: How to Bypass FRP Lock of Samsung J7 using Miracle Box? Ans: First flash with the frp unlock file with Odin3, after flashing it will automatically enable the USB debugging, then switch on the phone and connect to the Computer, Now open Miracle Box 2.54 and go to the ADB Tab and use FRP unlock option or put the phone into Download mode after flash and then go to Samsung Tab then select Reset FRP. How Bypass FRP Google Account Samsung Odin Method? 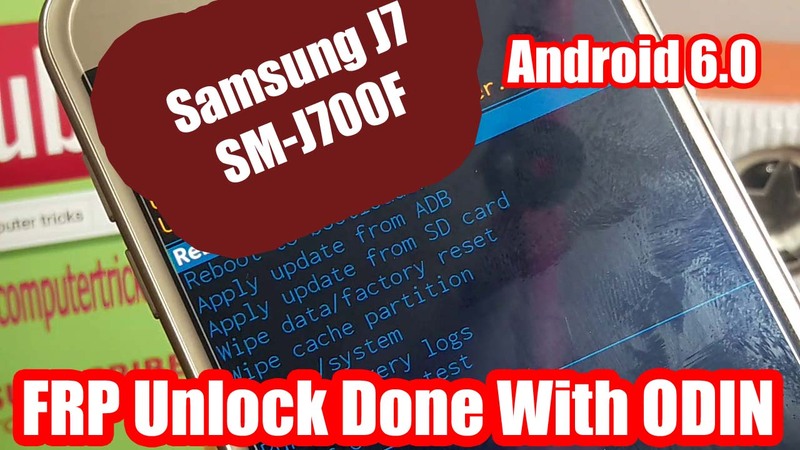 Samsung J7 SM-J700F FRP Unlock Google Account With One Click. What is the easy way for Samsung 7.0 FRP Lock Remove With Odin Tool? How to unlock FRP Google Account Unlock J7 J710FN Using Odin? How to Reset Samsung FRP Google Account By Odin3? Bypass Google Account Samsung J7 SM J700F Using Odin3 Downloader 2018. Samsung J7 FRP Remove and FRP File Download. How to Bypass FRP of Samsung J7 Android 6.0?